Congratulations! Yes, it’s Tuesday morning, not Monday, which makes this week’s roundup a bit late. What can we say? There’s been a lot going on and there’s a large tournament that has demanded a lot of attention. 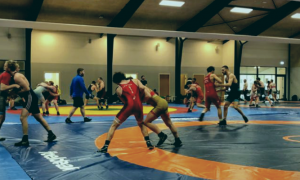 Fargo week is once again upon us, that special time each year where the best age-group wrestlers in the country battle it out for national supremacy (kind of). 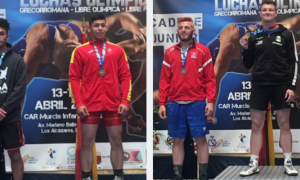 Some really impressive performances in the Cadet National finals made for can’t-miss viewing, with Theorius Robison (COL), Hamdan, and Raimo all picking up titles after enjoying strong runs throughout the tournament. 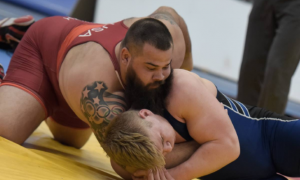 Plenty of these athletes are multi-style competitors (with a few claiming they came for Greco as a warm-up for freestyle later in the week), but we’ve seen enough ability on display to believe otherwise. 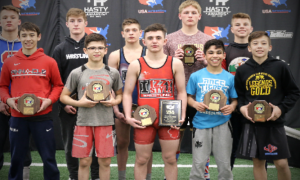 There is just too much talent to ignore and if just a few of these kids gravitate more towards Greco, the program is going to be well-stocked for a long, long time. As you were. 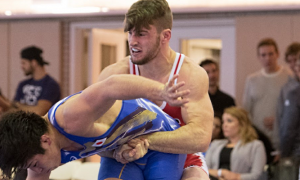 The Cadet National finals were really fun to watch, aside from some very curious officiating (there’s a difference between encouraging action and knocking a kid because you feel like you need to let everyone know you’re an official). But overall, most of the matches scored very high on the watchability scale. Jordan Hamdan (MI, 113 lbs) was down 8-0 (!) before storming all the way back against Reece Wittcraft (OK). Fine, huge comebacks at the Cadet level aren’t exactly crazy unusual, but in a Fargo national final? Hamdan picked up four big points to come within two and from there he didn’t over-extend himself. Instead, he stayed within his game, forced a couple of step-outs and next thing you know, Hamdan was out in front. Props to this kid for keeping his composure and taking it back bit by bit under the lights. Yeah, yeah, Theorius Robison (CO, 120 lbs) wasn’t totally anonymous coming in. At the same time, his was a name not everyone knew. That all changed between Sunday morning and yesterday afternoon. Robison assaulted his bracket and then finished the job with an astounding performance versus Atilano Escobar (AZ). Escobar didn’t know what hit him but that’s okay. Fargo has a habit of introducing wrestlers to the limelight and this was a coming-out party for Robison. A dazzling five, a solid two, and then four more (including a long-distance duck to seal it) were all that was required to give Robison a day he’ll remember. Along with everyone else. The tournament’s Outstanding Wrestler, Tyler Curd (MO, 220 lbs), showed why sometimes, it’s good to stick with a move that works. Curd employed a snapdown-heavy attack on Illinois bruiser Jace Punke to rattle off a 14-3 tech in their final. It was a bit of a departure in one respect. Curd demonstrated a preference for throws during his march through the bracket, but always kept that vicious snap in his back pocket for when it was necessary. It was against Punke, a talented Greco grappler who rarely gives up bad position. Curd was impressive in taking out Cohlton Schultz (CO) and every bit as much against Punke. Those are two glossy names to get past in an event like this and Curd did so in style. The Cadets have wrapped it up and the Juniors are now entering the quarterfinals. Lots of familiar faces are still in it — Dack Punke (Ill, 113 lbs); Dalton Duffield (OK, 120 lbs); Taylor LaMont (UT, 132 lbs); Mitchell McKee (MN, 138 lbs); Fritz Schierl (WI, 160 lbs); Kamal Bey (CO, 170 lbs); Clay Lautt (KS, 170 lbs); and Carter Isley (IA, 285 lbs) are just some of the names hunting for titles. It’s been dominance thus far for the favorites, though things have a tendency to tighten up as the rounds progress. Of course, a few of these boys are expected to keep stomping right through the entire thing. By now you have heard all about the report by Dr. Richard McLaren regarding Russia’s doping controversy. This first opened up a couple of months ago. In wrestling circles, speculation drove the conversation. Well, it’s not speculation anymore. Russian officials orchestrated a massive doping structure going back at least a couple of years though initially, all of this was figured to be centered mostly around track and field and other sports not wrestling. That has changed, as it has come out that over 20 Russian wrestlers were also involved in the scandal. The very idea that Russia may very well receive a blanket ban from the IOC is almost unthinkable. Talent decorates that roster like bulbs on a tree in December. At the same time, you just can’t have it. Can’t have WADA mixed up in red tape, can’t set (yet another) shady precedent, and you can’t rob clean athletes of the chance to compete in a fair environment in the biggest event of their lives. So while a complete and utter disappointment from a sporting perspective, a ban is the only course of action that makes any sense this close to Rio. Here it is, the second full week of the pre-Olympic camp in Colorado Springs. Time is getting short and those of us outside of the room will probably agree that it feels like it’s all a blur. But there is a regiment and a plan the staff is sticking with and it is all geared towards ensuring the four Olympians are in peak condition heading into Brazil. In last week’s report, US National Team head coach Matt Lindland broke it down even further than he had previously. The athletes are guided more by their heart-rates than they are by timers. On top of that, they get to look forward to the whole “Rio Match” experience once more, which is similar to “shark bait” in its own way but for some reason comes out sounding way more debilitating. Oh, that might be because there is a version of it where the wrestlers go as hard as they can on an AirDyne for one minute followed by battle ropes for another minute. However, according to the Coach Lindland, they’re not quite there just yet. Either way, yikes. A two-part feature on Robby Smith is coming at you this week, so be prepared. 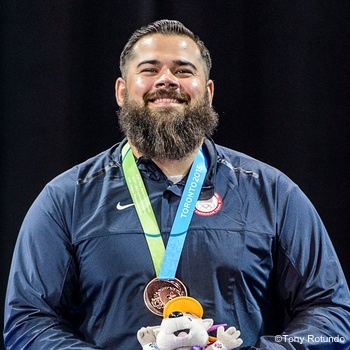 The first is a full interview with the US Greco Olympian where like always, he isn’t afraid to speak from the heart and get down to business. The second is a profile piece detailing his parents’ role in his career. Behind every successful athlete is usually a supportive, nurturing family but the Smith crew takes it a little bit further than that. We’re talking extensive travel, life lessons, a drum, and a mom who refuses to not be there for her son, yet can’t bear to watch him wrestle. It’s incredibly insightful stuff so hopefully, you’ll check all that out when it drops. 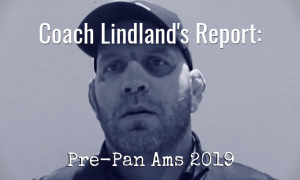 An all-new Coach Lindland’s report. Go take a look at the piece on Matt Ciampa and Eclipse. His club uses a Greco-first approach in its program, though a key difference is that Ciampa sees an intrinsic value in the other styles and believes there is a complementary relationship between them all. 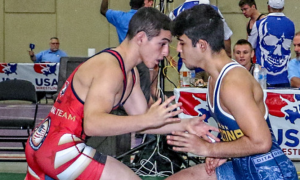 Whatever he believes, it’s working, as Eclipse puts more kids on the podium at Fargo than anyone else in New Jersey.